Books from Robert Plamondon's Publishing Company, Norton Creek Press. No poultry topic seems to attract as much interest as housing -- chicken coops. No topic is more important than chick brooders. So I'll get you started on both topics. There was a saying in the old days, "The best chicks come out of the sorriest houses." This is because farmers have a tendency to button up the houses too tight, leaving them under-ventilated. You want ventilation, but not because the house is coming apart at the seams. Chicken housing can be cheap or expensive. If you're interested in gracious country living, then by all means build a chicken mansion, if that's what you like. 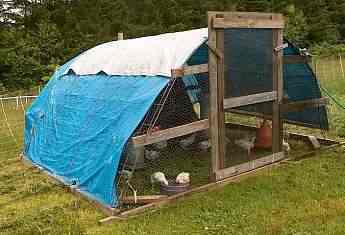 My goal, though, is to have chicken coops that last forever but can be built very quickly. I have a lot of them. Any chicken house looks pretty good if it's off in a nice green pasture. Chicken coops are a traditional first project for people who don't know anything about carpentry, so if you don't know anything what you're doing, poultry housing is the place to start. Open Chicken Coops Work Best, Even in Winter! Don't be fooled by people who say that chickens need to be shut up tight all winter: an outdoor lifestyle is what the chickens need, year-round. And if they can't go outside, they still need a light, airy, well-ventilated chicken coop. The chicken coop plans on the market want you to build dank and stuffy chicken dungeons, which is exactly what they don't need. 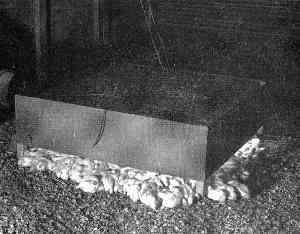 Instead, you should read Fresh-Air Poultry Houses, the bible of open-air chicken coops for all climates. This book is an oldie but a goodie, going into every detail and answering every objection. Everyone who has raised free-range or pasture poultry know how much they thrive with an outdoor lifestyle. Fresh-Air Poultry Houses shows you how the right housing can cling to these benefits even when the chickens have to stay indoors. Highly recommended. Click here to find out more about turkey and chicken coops made of inexpensive, lightweight cattle panels. This housing style was invented by my wife, Karen Black, and has been adopted everywhere. Read this article on chicken coops that I wrote for ATTRA (Appropriate Technology Transfer for Rural Areas). It talks about all kinds of chicken coops, including "chicken tractors" (portable pasture pens). More Chicken Coop Construction Info. Read My Book on Chick Care! This is a good place to plug my book, Success With Baby Chicks (Norton Creek Press, 2003, $15.95). You can buy it from Amazon.com, among other places. It has 155 pages on baby chick care. This FAQ hits a few of the high points, but there's a lot more interesting stuff in the book than I can find room for here. Click here to read about our new unheated pasture hover that uses the chicks' own body heat to keep them warm. This allows chicks to be moved to unheated houses earlier. This is an old idea, but I invented the version that uses reflective bubble insulation, which is easy to use and very lightweight. Brood 250 chicks in sub-freezing temperatures with only two heat lamps! This simple project takes only two hours to build and costs around $30. The brooder is made from a sheet of thin plywood, insulated with a layer of wood shavings. Two porcelain lamp sockets hold heat lamps that lie horizontally. 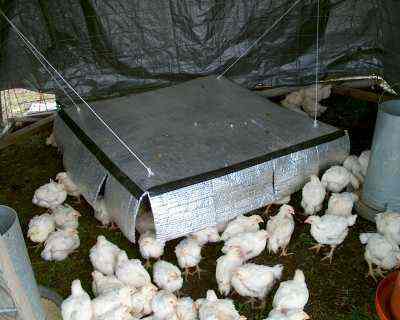 We have three of these brooders and they really work! Our chicks were warmer and we saved over $100 in electric bills. This link takes you to a copy of the original Ohio Experiment Station bulletin describing the brooder. More Baby Chick Care Info. I publish books that I believe in, under the Norton Creek Press label.